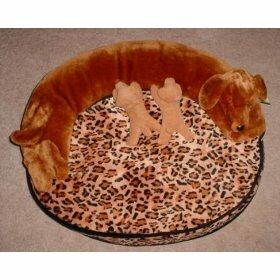 Your dog will absolutely love this cushy Leopard bed! Herbal Dog Beds are fantastic for young, mature, and small dogs. Just heat the herbal insert briefly in the microwave to create a warm, comfy place for your dog to nap. The warmth is like snuggling up with the litter. For older pets, the moist heat soothes arthritic joints and sore muscles. To HEAT: Remove insert from the top zipper opening and place on a towl in the microwave. Heat for one minute, turn and rotate insert, then increase in 30 second increments to determine the best heating time. Do not leave unattended and DO NOT OVER HEAT or exceed 2 minutes. Always test before using. Insert should beel warm, not hot, to the touch. If your dog needs something cool, you can put the same insert into the freezer. To COOL: Use a ziplock bag to protect from moisture and place in the freezer. Can be left indefinitely until needed. The attached stuffed puppies are meant to be detached as play toys for your dog. Machine wash cover only. Do not get herbal insert wet. Insert is filled with buckwheat and lavender.